Please come see us at the Northern Valley Earth Fair. The World Science Festival returns on May 29 for its 12th annual science spectacular. Join us for a week packed with over 70 events that take science out of the lab and into the streets, parks, museums, and premier performing arts venues of New York City. Through eye-opening discussions, vibrant debates, mind-expanding explorations, powerful theatrical works, insightful films, hands-on experiments, and major outdoor experiences, festival-goers of all ages will join the world’s leading thinkers for an unforgettable celebration of science that’s sure to inspire and excite. Striped bass and bluefish and fluke, oh my! Now in its fourth year, this hugely popular, all-age, hands-on event is a celebration of the marine life in the waters surrounding our five boroughs. 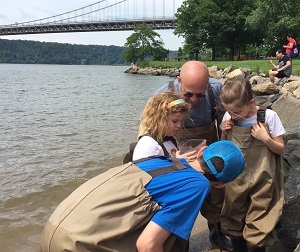 Top marine biologists and scientists will work with you and your kids to discover–and count–the many species of fish and marine creatures (even seahorses) right here in our own city waterways. No net needed. We’ll provide everything, including waders. Just head on down and help us count. The Great Fish Count is FREE and open to the public. LOCATION and MORE DETAILS TO FOLLOW.